This is a really clever idea. The brilliant bit for me is that you can scan your keys in advance and they will keep the scan, so that if you get locked out you would be able to have a new one created (assuming there was a machine nearby!). Thinking about it, that's a service that traditional high street locksmiths could probably offer pretty easily, and probably should. 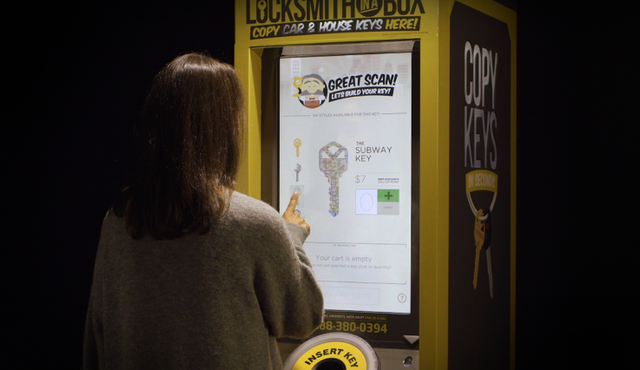 The company allows you to scan your key, either via mobile app or at an in-store kiosk, creating a digital copy. It can then ship you a key when you want a copy, or you can have one printed instantly at a kiosk — pretty handy if you get locked out. KeyMe doesn’t just copy regular house keys, but also car keys with transponder chips. Founder and CEO Greg Marsh said his goal is “disrupting the locksmith industry” by creating a key duplication service that’s more convenient, more affordable and even more accurate than existing services.